So we have a problem using tree rings to measure temperature. 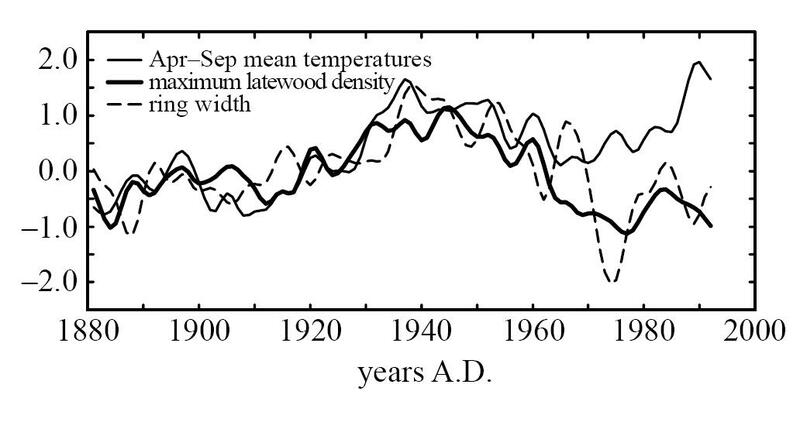 The problem is that as temperatures have risen in recent decades, the same tree rings that purport to show that the Medieval Warm Period (MWP) was not as warm as today, sort of peter out, you know, “decline.” This is known as the Divergence Problem. How does Wikipedia describe the possible causes of this issue? Do you think it is possible that during the MWP it was warm enough to stress the same trees as well? It’s a rhetorical question. Of course if it were very warm during the MWP, the same factors would likely apply. In other words, Mann’s claim of today’s warming being “unprecedented in the past 1500 years” is not supported by the tree ring methodology that he uses. The idea that some new unknown factor has come into play is just a fig leaf to avoid drawing the obvious conclusion.